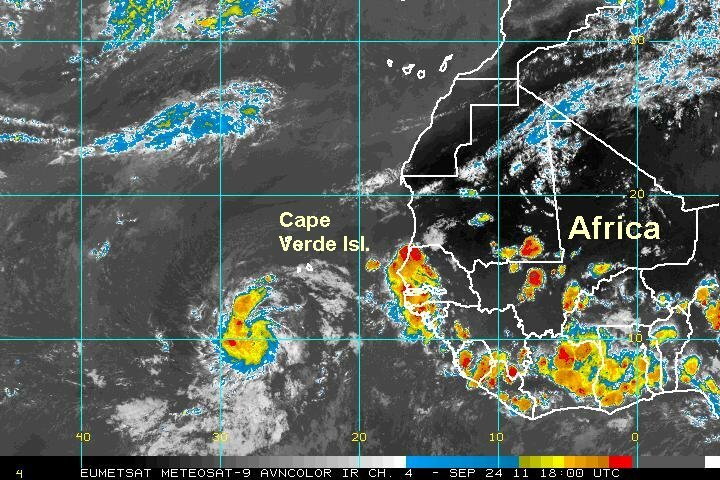 TD 17 is associated with a compact ball of convection well south of the Cape Verde islands. Additional strengthening is likely and TD 17 may become the next Atlantic tropical storm within the next 12-24 hours. At 7 am edt / ast TD 17 was centered at 10.7 N / 25.4 W or about 300 miles south of the southern Cape Verde Islands. Top sustained winds are estimated at 35 mph (NHC 35 mph earlier advisory). Movement: west 15 mph. Pressure estimated at 1007 mb. Forecasts take TD 17 west, then northwest the next several days into the open Atlantic. TD 17 is not a threat to land. 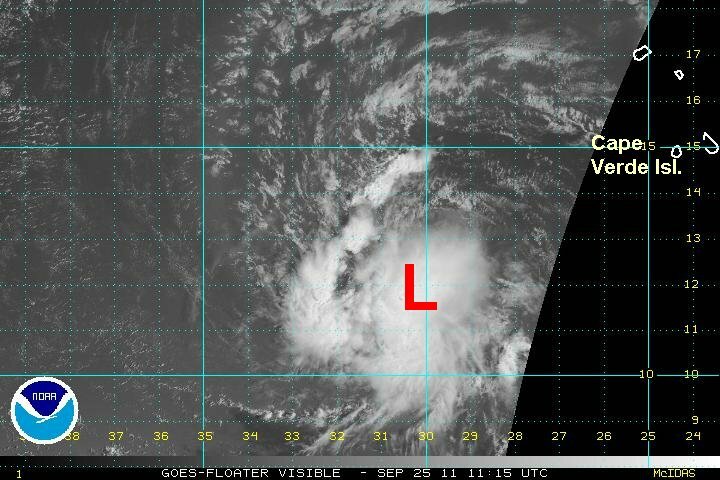 There is enough of a circulation and convection so that TD 17 can be named Philippe. At 4 pm edt / ast TD 17 (Philippe) was centered at 10.7 N / 29.0 W or about 400 miles ssw of the southern Cape Verde Islands. Top sustained winds are estimated at 40 mph (NHC 35 mph earlier advisory). Movement: west 15 mph. Pressure estimated at 1007 mb. 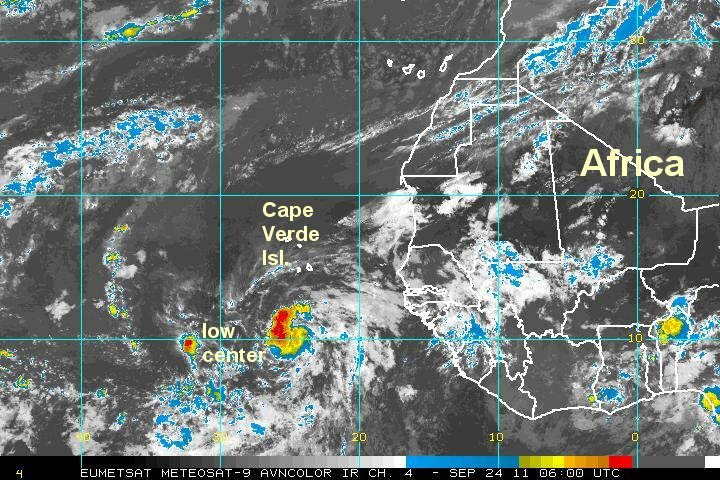 Forecasts take Philippe west, then northwest the next several days into the open Atlantic. Philippe is not a threat to land. Philippe was upgraded to tropical storm strength yesterday at 5 pm edt as expected. Outflow aloft looks favorable for additional strengthening at this time. A ball of convection is also associated with the low, although not extremely impressive. 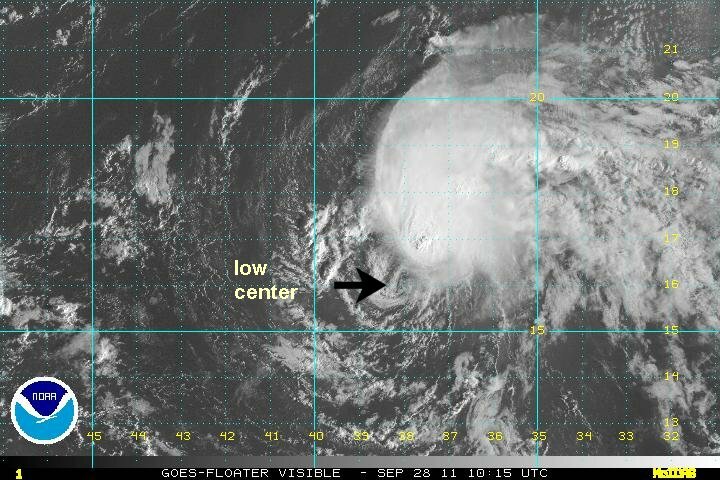 I am estimating the low center more southwest than that of NHC. At 9 am edt / ast Philippe was centered at 11.7 N / 30.5 W or about 450 miles wsw of the southern Cape Verde Islands. Top sustained winds are estimated at 45 mph (NHC 45 mph earlier advisory). Movement: wnw 13 mph. Pressure estimated at 1004 mb. Forecasts take Philippe wnw, then northwest the next several days into the open Atlantic. Philippe is not a threat to land. Philippe has changed little overnight. 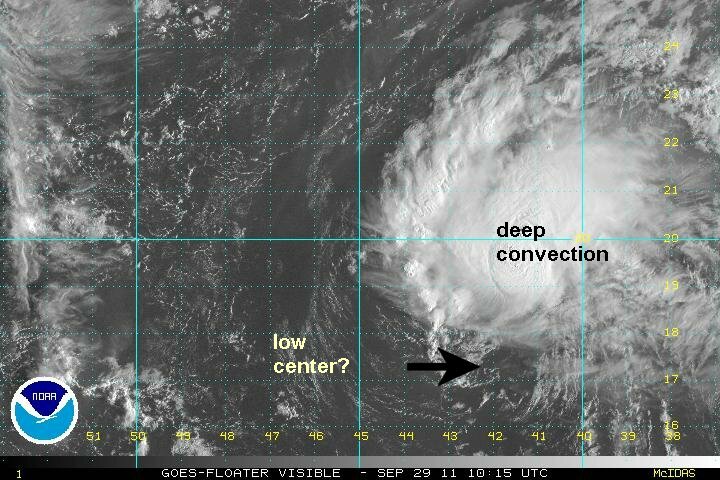 The low is displaced a little to the north of the "ball' of convection. Some banding is noted on the northwest side of the circulation and additional strengthening is possible. It will depend (again) on how much shear Philippe encounters from a trough to the north. At 7 am edt / ast Philippe was centered at 14.7 N / 33.5 W or about 620 miles west of the southern Cape Verde Islands. Top sustained winds are estimated at 60 mph (NHC 60 mph earlier advisory). Movement: wnw 13 mph. Pressure estimated at 997 mb. Forecasts take Philippe wnw, then northwest the next few days. After that, models diverege. Some more Philippe north then northeast, other more northwest. Philippe's northern half of its circulation has been exposed by windshear. Deep convection is building near the center again, but is not as extensive as before. Because of the weakened convection, I am dropping winds down a touch. 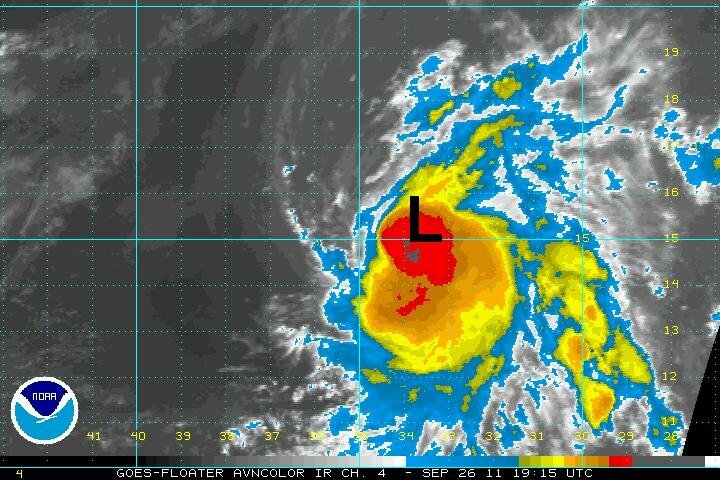 At 5 pm edt / ast Philippe was centered at 15.4 N / 34.4 W or about 695 miles west of the southern Cape Verde Islands. Top sustained winds are estimated at 55 mph (NHC 60 mph earlier advisory). Movement: nw 8 mph. Pressure estimated at 997 mb. 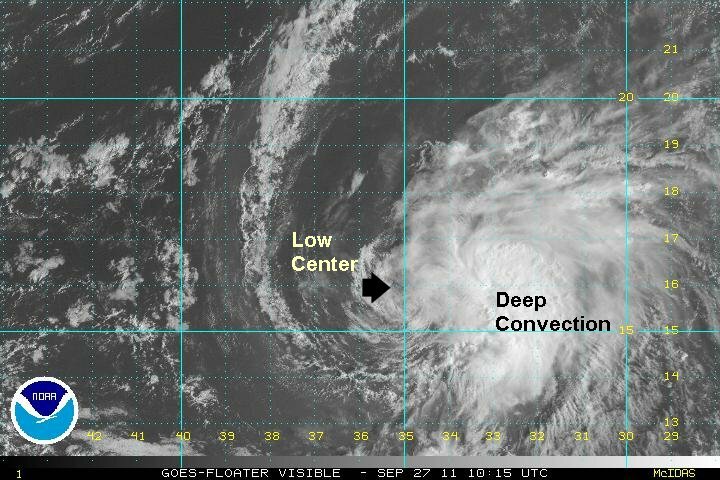 Philippe is a little south of the official NHC position. It is very difficult to estimate postion with IR imagery. I am also going a little weaker because of windshear. At 7 am edt / ast Philippe was centered at 15.8 N / 34.8 W or about 725 miles west of the southern Cape Verde Islands. Top sustained winds are estimated at 45 mph (NHC 50 mph earlier advisory). Movement: wnw 10 mph. Pressure estimated at 997 mb. Forecasts take Philippe northwestward where it should gradually weaken over the next several days. Models stall Phillipe and turn it more west by late this week as a high pressure system steers it farther west. No significant change in strength is anticipated at this time. As expected, the hurricane center adjusted their location of Philippe. Philippe is still badly sheared with convection hanging on on the east side of the circulation. It remains a minimal tropical storm. 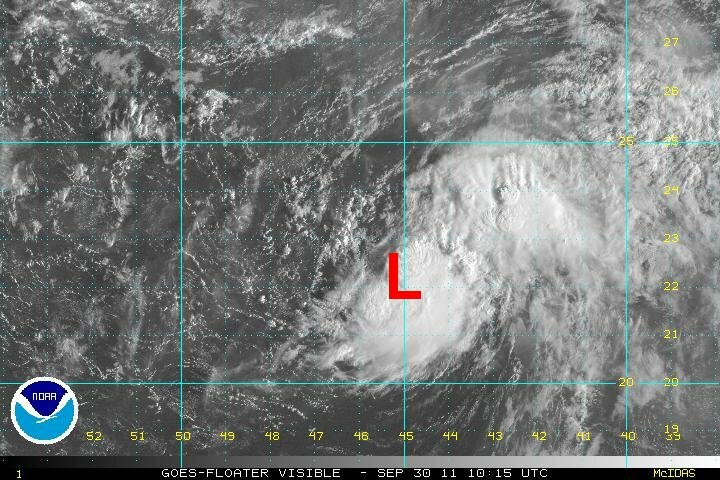 At 4 pm edt / ast Philippe was centered at 15.8 N / 36.0 W or about 780 miles west of the southern Cape Verde Islands. Top sustained winds are estimated at 40 mph (NHC 45 mph earlier advisory). Movement: wnw 5 mph. Pressure estimated at 1003 mb. 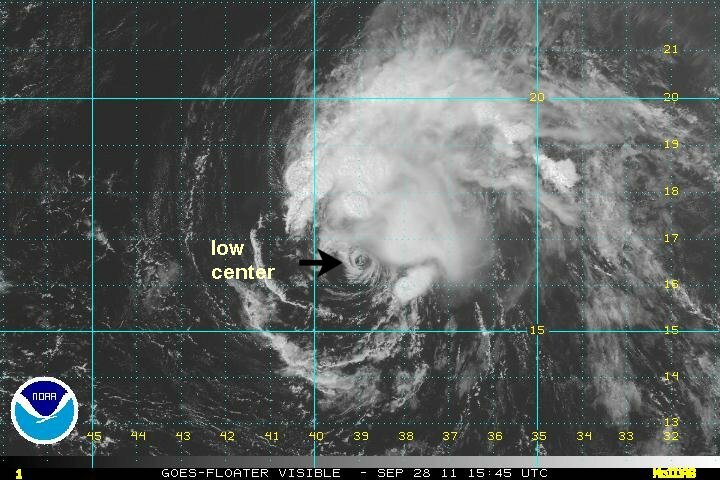 Similar to yesterday, the hurricane center had the low center a bit off. Instead of 16.5 N it is closer to 16.1 N. As I mentioned yesterday, it is very difficult to place a surface low with IR imagery like they did. 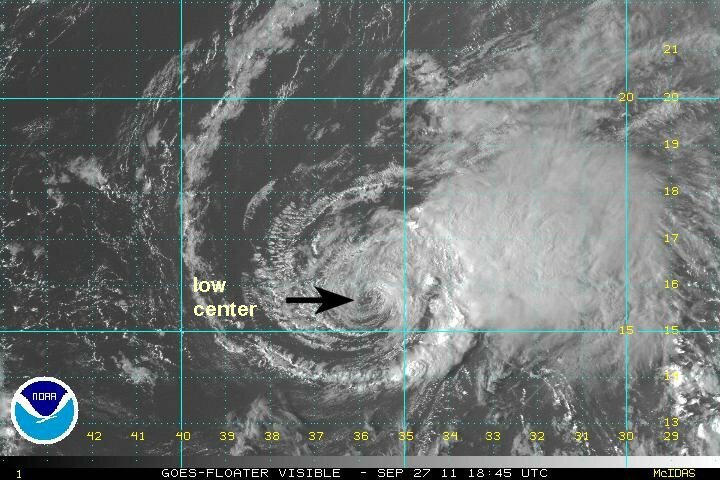 With the benefit of visible satellite imagery a few hours after their advisory, I could make out the low center easily. Convection has increased since last evening, but not enough to warrant any appreciable strength change. Philippe remains a fish storm (a tropical system on affecting land). At 7 am edt / ast Philippe was centered at 16.1 N / 38.0 W or about 910 miles west of the southern Cape Verde Islands. Top sustained winds are estimated at 40 mph (NHC 40 mph earlier advisory). Movement: wnw 10 mph. Pressure estimated at 1006 mb. Forecasts take Philippe northwestward where it should gradually weaken over the next few days. Models slow Phillipe and turn it more west by later this week as a high pressure system steers it farther west. No significant change in strength is anticipated at this time as it becomes a tropical depression in the next 24-48 hours. Deep convection is still holding onto the circulation of Philippe. There have been some interesting changes to the forecast outlined below. 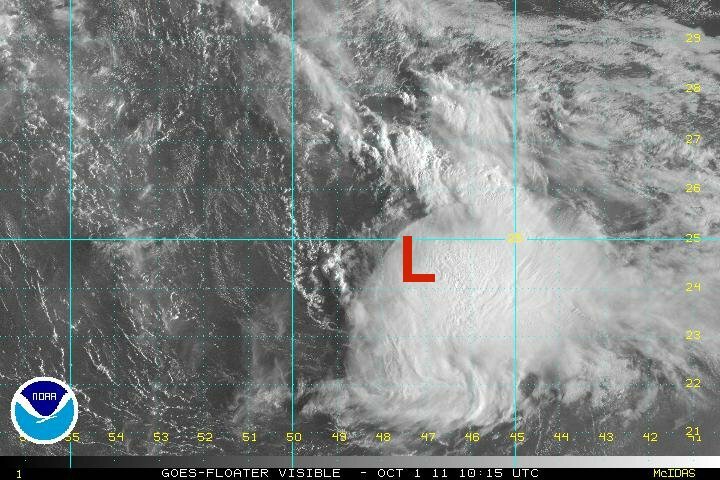 At 5 pm edt / ast Philippe was centered at 17.0 N / 39.7 W or about 1040 miles west of the southern Cape Verde Islands. Top sustained winds are estimated at 45 mph (NHC 40 mph earlier advisory). Movement: wnw 12 mph. Pressure estimated at 1006 mb. Forecasts take Philippe northwestward where it should gradually weaken over the next few days. Models slow Phillipe and turn it more west by later this week as a high pressure system steers it farther west. Recent models show Philippe turning southwest after this weekend and stalling Phillipe northeast of the Caribbean. This portion of the forecast needs to be followed closely. 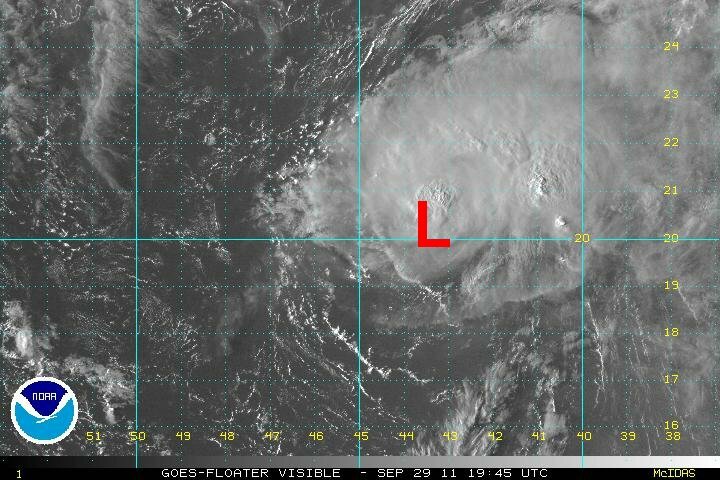 Once again the placement of the low by NHC looks to be off this morning. I will be the first to say it is an extremely hard task to accuractely place a surface low on a sheard tropical system with an IR picture. With that being said, I'm not exactly sure where it is either. It's just not at the official NHC placement. Visible satellite imagery shows this morning a spin well to the north which appears to be mid level with the deep convection. Another low level spin is farther south within several tenths of a degree where the low should be. 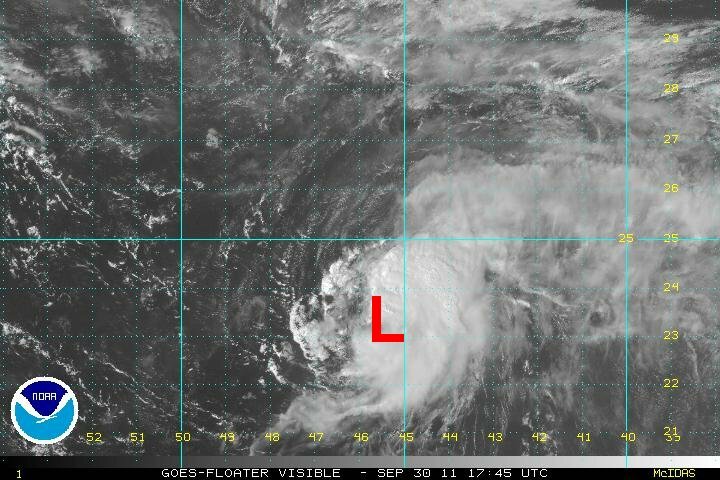 If the low is indeed there it is in bad shape because the circulation looks very weak. So all of this means that Philippe is badly sheared and is still struggling to keep strength this morning. At 7 am edt / ast Philippe was centered at 17.5 N / 42.3 W or a little over 1200 miles west of the Cape Verde Islands. Top sustained winds are estimated at 40 mph (NHC 45 mph earlier advisory). Movement: wnw 13 mph. Pressure estimated at 1005 mb. Forecasts take Philippe northwestward into the open Atlantic the next couple of days. Models turn it more west by this weekend as a high pressure system steers it farther west. Models then turn Philippe southwest after this weekend and stalling it northeast of the Caribbean by about 200-300 miles into early to mid next week. Philippe looks a little stronger this afternoon, so my wind estimate is now the same as the hurricane center's. Deep convection has built up a little more today. 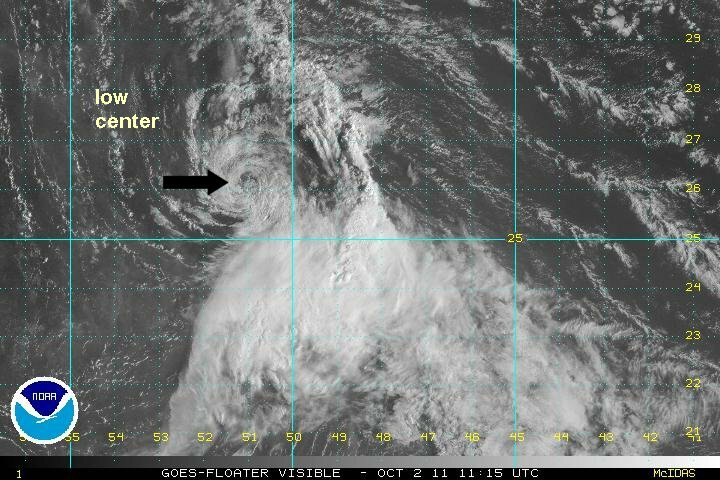 The low center from this morning was actually located under the thunderstorm mass to the north and not south out of the convection. This means that Philippe is not quite as sheared as yesterday. At 5 pm edt / ast Philippe was centered at 20.2 N / 43.6 W or a little over 1210 miles ene of the Leeward Islands. Top sustained winds are estimated at 45 mph (NHC 45 mph earlier advisory). Movement: nw 13 mph. Pressure estimated at 1004 mb. Forecasts take Philippe northwestward into the open Atlantic the next couple of days. Models turn it more west by this weekend as a high pressure system steers it farther west. Models then turn Philippe southwest after this weekend and slowing it northeast of the Caribbean by several hundred miles into early to mid next week. Philippe has changed little overnight. It remains a weak tropical storm as it continues its slow trek to the northwest. Deep convection remains near the center of the low with lttle to the northwest. Northwesterly shear continues to affect Philippe. At 7 am edt / ast Philippe was centered at 22.1 N / 45.1 W or a little over 1125 miles ene of the Leeward Islands. Top sustained winds are estimated at 45 mph (NHC 45 mph earlier advisory). Movement: nw 13 mph. Pressure estimated at 1004 mb. Forecasts take Philippe northwestward and turn it more west by this weekend as a high pressure system steers it farther west. Models then turn Philippe southwest after this weekend and stalling it northeast of the Caribbean by 200-300 miles into early to mid next week. It will then forecat to move northeast back into the Atlantic late next week. Philippe is still battling shear today with the western side of the circulation nearly void of convection. 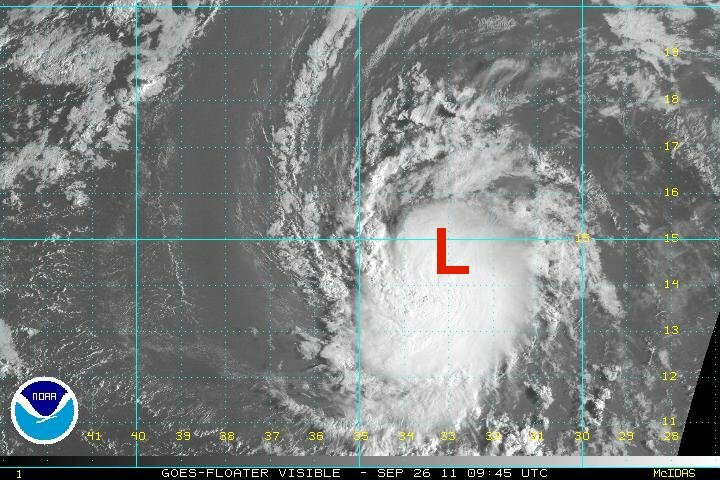 Enough convection exists on the eastern side of the circulation to classify Philippe as a minimal tropical storm. At 4 pm edt / ast Philippe was centered at 23.2 N / 45.9 W or a little over 1160 miles ene of St. Martin. Top sustained winds are estimated at 45 mph (NHC 50 mph earlier advisory). Movement: nw 13 mph. Pressure estimated at 1004 mb. How many times can the headlines read "No Change" for Philippe? One more time - at least. Philippe continues to be a minimal tropical storm with winds about 50 mph. It is still being moderately sheared from northerly winds aloft. The convection is somewhat impressive but confined to near and mostly south of the low center. At 7 am edt / ast Philippe was centered at 24.4 N / 47.5 W or a little over 1190 miles ene of St. Martin / 1175 miles ese Bermuda. Top sustained winds are estimated at 50 mph (NHC 50 mph earlier advisory). Movement: nw 9 mph. Pressure estimated at 1004 mb. Forecasts take Philippe northwest then west northwest this weekend as a high pressure system steers it farther west. Models then turn Philippe southwest after this weekend and stalls it north of Puerto Rico by about 200-300 miles into early to mid next week. It then is forecast to move northeast back into the Atlantic late next week. The hurricane center had estimated Philippe at 70 mph a few hours ago. Since then, upper air winds have stripped all of the convection from Philippe. This means that Philippe is much weaker. I doubt that Phiipple was even 70 mph - sustained - with an estimated pressure of 993 mb. That is is very high pressure! At 8 am edt / ast Philippe was centered at 26.2 N / 51.1 W or about 935 miles ese of Bermuda. Top sustained winds are estimated at 45 mph (NHC 70 mph earlier advisory). Movement: wnw 10 mph. Pressure estimated at 993 mb. Forecasts take Philippe wnw then west today and tomorrow. Models then turn Philippe wsw and stall it north of Puerto Rico by about 300 miles into the middle of this week. It then is forecast to move northeast back into the Atlantic late this week.